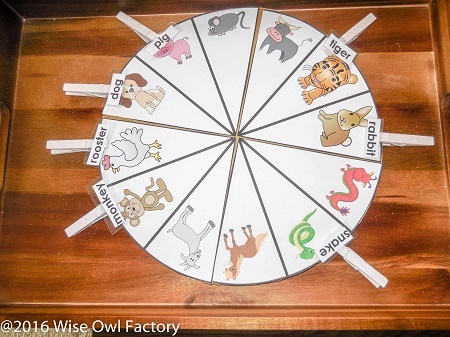 This post is about the Chinese Zodiac for children and the Lunar New Year. Safari Ltd. sent me a package of Chinese Zodiac animals (non-affiliate link) in one of their Super Toobs, and they are super cute! 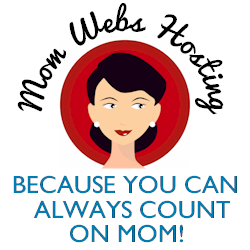 This is for the “How i Safari” promotion going on now. 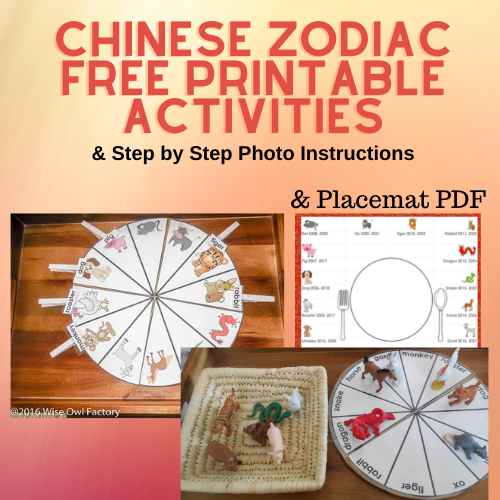 This post includes a free printable with corresponding activities and some information about the Lunar New Year. There was no other compensation involved, and this review is my own opinion. Children will enjoy these figurines! Gnorman the Green Gnome recently visited Shanghai and Lunar New Year preparations were everywhere, so it is fresh on his mind. Lunar New Year is not only a Chinese event although many people think so. It marks the new calendar year in other countries such as Vietnam, Japan, Korea, Tibet, Thailand, Mongolia, and others. This happens not on January 1st, but a date determined by the lunar calendar. Some years have 13 moons which complicates the determination of the date. The Chinese Zodiac is a little different in some interpretations. Vietnam uses the goat which is in the Safari Ltd. Set, and people in China might use the sheep or ram or goat as the Chinese character can mean any of these 3 animals. Did you know Chinese names often have a character handed down or shared between generations? Did you know a round lantern is used for the New Year in China, and not the usual oblong shaped lanterns? Have you noticed that? I did not realize the difference until Gnorman told me about his business trip. This link is a post with a free A to Z slide show about Shanghai. 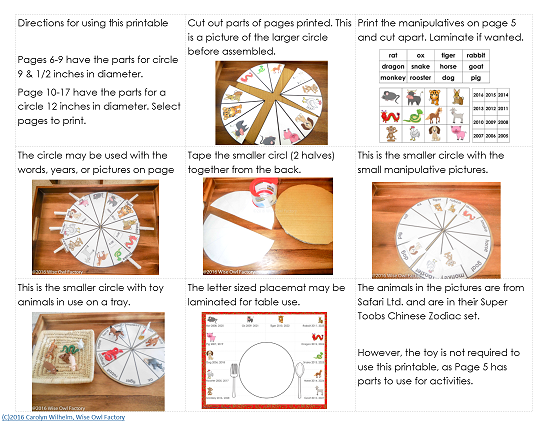 Children will like finding their own birth year and corresponding animal, so I included some letter sized placemats in the PDF. Although it is not the actual full year for people who follow the lunar calendar as that is coordinated with the cycles of the moon, so that information about dates may be checked at this link. Some people think the birth year and month determines personality. 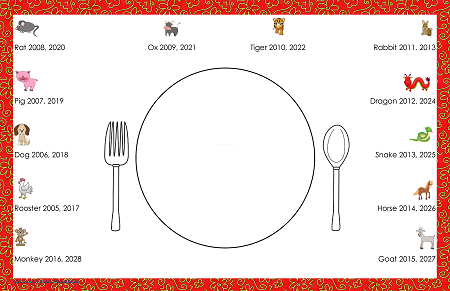 One of the placemats is in the Chinese style and has a spot for chopsticks, and one is in a western style. Gnorman the Gnome thinks chopsticks are very difficult as they are so much larger than him. Children are surprisingly good at using this utensil if given the opportunity. 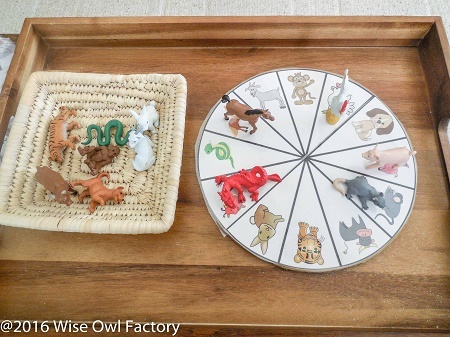 These activities may be used with or without the realistic animal figurines. The Lunar New Year is more than about the change of the year, as it is a chance for a new beginning. Extra cleaning is done prior to the change of years to ensure good luck. Cleaning during the celebrations is thought to throw good luck out of a house, so it is not advised. New clothing is worn to also help bring good luck, and some people wear red underwear. Dragons are considered lucky, and are credited with bringing rain as the Lunar New Year represents Spring. You will also see peach blossoms everywhere as peaches represent longevity. Peach blossoms are so noteworthy in China that 3rd day of the 3rd month also has its own Peach Blossom Festival. Feng Shui is popular in China. There are also superstitions believed by some. Gnorman noticed there are buildings without a floor numbered 4, as the word for is similar to the Chinese word for death. If a hotel caters to westerners, it may not have a 4th or a 13th floor in the numbering system. When Gnorman went to work, however, his western employer did have a 4th floor. There are other ideas about increasing luck, too. Living by water is considered fortunate. Newborns are given silver bracelet, sliver amulet to protect against misfortune. The number 8 is also thought to be lucky!